The characterisation of the tenth century as a dark age for historical written sources has deep roots. But the liturgy constitutes one area where manuscripts survive in increasing quantities from the years 900 to 1050 compared to those copied in the previous century and a half. Moreover, such records exist for communities for which we now lack substantial archives or narrative texts. Liturgical books and writings about the liturgy thus have the potential to cast light on how such communities sought authority in the past and made clear choices about which aspects of the past they chose to use and not use. That the choice of past authorities was itself grounded in earlier traditions is suggested by the following example. Writing in south-western France in the second half of the 1020s (1024/5-1029), Adhemar of Chabannes recorded this tale of how, under Charlemagne, the Franks came to adopt the Roman method of chant, and how Metz became the dominant school for chant within Frankia. When Charlemagne celebrated Easter in Rome in 787 a quarrel arose between the Roman and Gallic singers about who sang better; the Romans criticised the ‘rusticity’ and animal noises of the Gauls and invoked the authority of Gregory the Great to support their approach. Both sides appealed to the emperor, who after investigating the authority behind each group’ style, sided with the Romans, telling the Gauls: ‘Return to the fons of St Gregory because it is manifest that you have corrupted the ecclesiastical chant’. Charlemagne therefore asked Pope Hadrian to send two singers from Rome to Frankia to correct the chant; one went to Metz, the other to Soissons. Then Charlemagne gave orders that the masters of the schools of all the cities of Frankia should bring their antiphonaries to one of these two Roman masters, and to learn from them the Roman-style chant. And so the Frankish antiphonaries were corrected and singers throughout Frankia adopted the Roman method of notation, and Metz became the most important school in Frankia. This story is well-known. Variations on it first appear only a century later after the events described in the last quarter of the ninth century in John the Deacon’s Vita Gregorii (c. 875) and Notker’s Gesta Karoli (c. 884-6/7). How, when and to what extent the Franks adopted Roman chant remains a lively subject of debate amongst modern scholars, but Adhemar’s story is of especial interest to this project because it highlights the extent to which the enactment of liturgical rites was dependent upon oral instruction rather than the written word, and the ways in which late ninth- and tenth-century writers established liturgical authority through the layering of different pasts. That two and a half centuries later Adhemar still thought it worth retelling the story of how the Franks came to adopt the Roman chant method demonstrates not only that liturgy mattered, but hints at the retelling of origin stories like this in the oral communities of monastic choir schools across post-Carolingian Frankia. Adhemar’s choice of vocabulary to describe liturgical change is conservative, echoing that of earlier ninth-century pastoral reformers. His account emphasises the authority of St Gregory: Charlemagne told the Frankish singers to return to the fons of St Gregory: Revertimini vos ad fontem sancti Gregorii. The emperor also reportedly accused them of contaminating (corrupistis) ecclesiastical chant and ordered that the Roman masters correct the Franks (corrigerent), and that the Frankish antiphonaries be corrected (corrigendum tradere). Adhemar thus emphasises how they moved from a world of difference and conflict between Gallic and Roman practice to one of harmony and unanimity. ‘In the name Christ begins this book of the sacraments for entire year edited by saint Gregory, the Roman pope: how the Roman mass should be celebrated’. 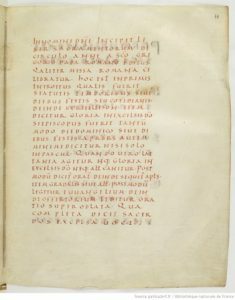 Munich, Bayerische Staatsbibliothek, Clm 10077, f. 9v. Image licensed under CC BY-NC-SA 4.0. Paris, BNF, Ms Lat. 12052, f. 44r (Ratoldus Sacramentary). Image in Public Domain. This statement of Gregorian authenticity continued to be copied into codices and serves as an imprimatur of their authenticity and authority. 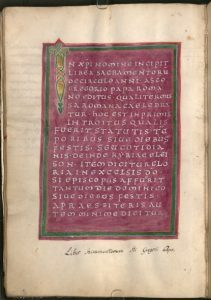 As this example suggests, liturgical books allow us to explore how communities understood and made use of both the Carolingian and Gregorian past in their religious lives. The Exeter strand of the project will focus on liturgical manuscripts like these sacramentaries. It investigates the ways in which older texts were copied and recopied across the tenth century, and how they came to be combined with new texts. It asks what such collections can tell us about the ways in which particular religious communities understood their own past, and which pasts had particular claims to authority in this period and why. Whilst local influences play a significant role in all such texts, because they both asserted and projected a view of the world as it ought to be, and because they shared common aims and purposes, such texts allow the modern scholar to make comparisons across Europe between communities located in areas which had been under the direct rule of the Carolingians in the ninth century, and in communities located on or beyond the periphery of that empire. Investigating the interplay between received text and local influence, between established text and recent additions, offers an opportunity to understand in a comparative context how and why different communities came to focus on particular aspects of the past at different points in their own history.